Today more innocent blood of my compatriots has been shed. The numbers of killed are high enough for today's killings to be referred to as a MASSACRE! Reports state that rooms in some hospitals are piled with dead bodies. One cannot help but ask where is the world??!! Young woman calling from Tehran describing the savage manner which the Islamic Republic's mercenaries attacked peaceful demonstrations with bullets, clubs, and chains!!! She describes the scene at today's demonstration as nothing less than a massacre! 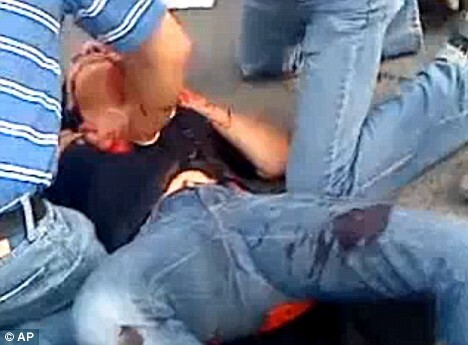 Reports of scores of Iranians being killed today by the Islamic Republic's mercenary forces and hundreds injured. I still cannot digest the news that injured people are not being taken to hospitals because the Islamic Republic's mercenary forces are arresting demonstrators at hospitals!!! Where is the outrage from that useless institution called the UN!?!?!!? The Islamic Republic's paramilitary "basij" force running away from a crowd of demonstrators whilst still opening fire on them! TEHRAN—The family, clad in black, stood at the curb of the road sobbing. A middle-aged mother slapped her cheeks, letting out piercing wails. The father, a frail man who worked as a doorman at a clinic in central Tehran, wept quietly with his head bowed. Everyone in the neighborhood knows the Alipour family. In addition to their slain son, they have two daughters. Shopkeepers and businesses pasted a photocopied picture of Mr. Alipour on their walls and windows. In the picture, the young man is shown wearing a dark suit with gray stripes. His black hair is combed neatly to a side and he has a half-smile. "He was so full of life. 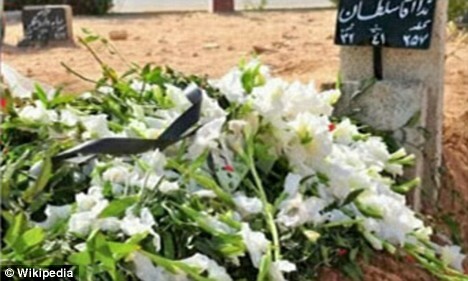 He had so many dreams," said Arsalan, a taxi driver who has known the family for 10 years. "What did he die for?" RIP Neda Agha-Soltan 1982-2009 - "Angel of Freedom"
Blood pours from a head wound. It is clear Neda has lost her brief fight for life. Neda's resting place. The terrorist Islamic Republic did not allow any gathering for the burial and have banned any commemoration of Neda. It has been posted on YouTube, Twitter and Facebook and has become a rallying point for anti-government protesters inside Iran and around the world. Her name even became a 'trending topic' on Twitter, showing that had become one of the most-repeated words on the microblogging site. Tribute websites have also begun to spring up. 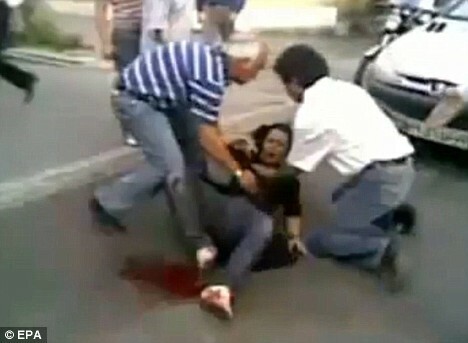 Reports say Neda was watching Saturday’s protests with her father when she was shot by Iran’s militia. A message posted with the original YouTube video alleges she was intentionally shot through the chest by a Basij member hiding on a rooftop. 'He had clear shot at the girl and could not miss her. However, he aimed straight her heart.' 'I am a doctor, so I rushed to try to save her. But the impact of the gunshot was so fierce that the bullet had blasted inside the victim's chest, and she died in less than two minutes. 'The protests were going on about one kilometre away in the main street and some of the protesting crowd were running from tear gas used among them, towards Salehi Street.' 'Neda' in Farsi means 'the call' or 'the voice'. 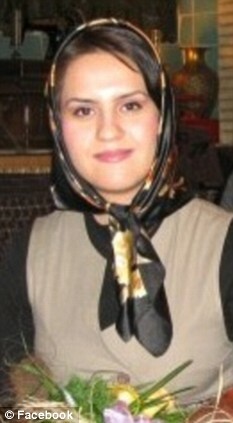 A website linked to opposition leader Mir Hossein Mousavi named the woman as 27-year-old Neda Agha Soltan. Mousavi warned supporters of danger ahead, and said he would stand by the protesters 'at all times.' But in the website letters, he said he would 'never allow anybody's life to be endangered because of my actions' and called for pursuing fraud claims through an independent board.The former prime minister, a longtime loyalist of the Islamic government, also called the Basij and military 'our brothers' and 'protectors of our revolution and regime. He may be trying to constrain his followers' demands before they pose a mortal threat to Iran's system of limited democracy constrained by Shia clerics, who have ultimate authority. Caspian Makan, Neda Agha-Setan’s fiancee, was interviewed by BBC Persia, noting that Neda would have turned 27 this year. “Neda’s goal was not Mousavi or Ahmadinejad, it was her country and was important for her to fight for this goal. She had said many times that if she had lost her life or been shot in the heart, which indeed what happened, it was important for her to continue in this path,” he said. Considering her young age she has taught a lesson to us all. However, many eye witnesses told BBC Persia that a large gathering took place with the intention of performing a memorial service at Al Reza Mosque at Nilofar square in Tehran. But the security forces intervened by throwing people out of the mosque and intervening with the service. BBC Persian tried to contact Neda Agha-Sultan’s other family members but was told by a close relative of hers that, for reasons of their own, the Agha Sultan family couldn't grant an interview. Injured Iranians being attended to by compatriots - the Islamic Republic is arresting any injured people taken to hospitals which has resulted in many injured Iranians not receiving the medical aide they need. This filthy criminal regime will pay for the blood of our heroes who have stood tall against the ruthless dictatorship. HIM Reza Shah II of Iran addresses a crowd of Iranians in Washington with his two daughters HRH Princess Iman & HRH Princess Noor listening in amongst the crowd. 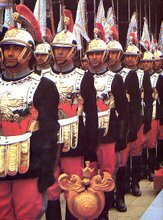 HIM Reza Shah II of Iran called for unity amongst Iranians from across the political spectra in support of the Iranian people fighting for their rights, for freedom, and for democracy to replace the Islamic Republic occupying Iran. Uploaded by mightier-than. - News videos from around the world. 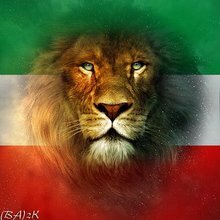 When I watch the bravery of my compatriots working together against the Islamic Republic's mercenery forces it makes me feel good and proud to be Iranian. These two following clips were just uploaded on youtube showing an Iranian woman shot dead in Tehran by the Islamic Republic's mercenary forces. These are EXTREMELY GRAPHIC & DISTURBING IMAGES! The protests were going on about 1 kilometers away in the main street and some of the protesting crowd were running from tear gas used among them, towards Salehi St. Her name was NEDA and she was 16 years old - let the world know. The rage and sadness within me right now is indescribable! The Islamic Republic will be brought to justice for the crimes against humanity which they have committed for the past 30 years and which today have intensified further with scores of innocent people having been killed in cold blood! Please spread these news and put pressure on your political representatives to condemn these crimes and to TAKE CONCRETE ACTIONS to support the people of Iran who are being slaughtered by the Islamic Republic!!! Embassy of Finland No. 2, Haddadian St., Mirzapour St. (former Soheil St.), Dr. Shariati Ave.
Canadian Embassy is rejecting injured protesters - staff is looking for doctors so that they can accept wounded. List of embassies in Tehran. Someone is reporting on Iranian radio that an elderly woman who was fighting back with her supporting cane was shot dead in Tehran. Demonstrations in provincial cities are said to be heavier and are being met with even more violence by the Islamic Republic's security forces. Phone lines are cut and internet speed is extremely slow across the country. Hospital close to the scene in Tehran: 30-40 dead thus far as of 11pm and 200 injured. Police taking names of incoming injured. I am still uncertain on where the people demonstrating this past week in Iran want to take this growing movement. Have they risen up because their votes in a sham s-election, supervised by a terrorist and corrupt regime, did not give the results they wished for? Or have people used the s-elections as an excuse to advance the freedom-fighting movement of Iran by using one of the Islamic Republic's selected candidates, Seyed Mir-Hossein Mousavi (an Islamic Republic servant, who served as PM during the darkest years of this terrorist regime marked by the genocide of political prisoners), as an excuse through which they can voice their rejection of this system? If the demonstrators truly believe that they can bring change through within this regime by bringing Mousavi to power they will be very disappointed when they realize that Mousavi endorses the foundations of this terrorist regime and will only bring cosmetic changes rather than uprooting the rotten system which has thrived on the Iranian nation's wealth and keeping them in the dark/isolated for the past 30 years. What I truly hope for is that the blood of innocent Iranians has not been shed because of this criminal Seyed Mir-Hossein Mousavi, and the infighting occuring between different factions within the terrorist Islamic system. I truly hope that people have reached a level of awareness where they see that there is no space for fundamental change within this regime and that they need to bring this regime down and hold a free and fair referendum on the future political system of Iran. I hope that people are not risking their lives for reform, which is a road already tried with the Islamic Republic's smiling mullah Khatami, but that people are fighting for freedom and democracy - to have their human rights restored and respected by a government elected by the people for the people. Tens of peaceful demonstrators have been shot point-blank or knifed to death by the Islamic Republic's paramilitary force, the "Basij", consisting of foreign merceneries and brainwashed and illiterate religious zelots people from rural areas. Reports from people on the scene confirm that many of these merceneries are Arabs imported from Iraq, Palestine, & Syria with no emotional ties to Iran/Iranians and who won't hesitate to crackdown on the demonstrations in the most savage of ways that they have been trained in. There are many disturbing videos that have been uploaded on youtube and elsewhere in the past few days showing Basiji's, riot police, and members of the various branches belonging to the Islamic Republic's Revolutionary Guard mercilessly attacking defenseless people in the streets (men, women, elderly) and breaking into peoples' homes and beating them for no reasons whatsoever. Hundreds of people across the country have sustained injuries and hospitals continue to receive a steady flow of casualties and injured people. There were reports that hospitals across the country had been given orders by the government not to treat injured Iranians which the regime refers to as "thugs, troublemakers, and hoodlums". With orders now having been given to the Islamic Republic's security forces to use maximum force the demonstrators will have no choice but to get armed in order to defend themselves and their compatriots who are fighting for their basic rights - their human rights - which this terrorist and anti-Iranian regime has denied them since its inception 30 years ago. Despite the bloodshed and violence the demonstrations keep growing larger as people find the courage to fight back against the people who are suppressing them and killing their compatriots. I WILL KILL WHOEVER KILLED MY BROTHER!